A care home chef has decided to make her own recipe book after word spread across Scotland about her impressive baking skills. 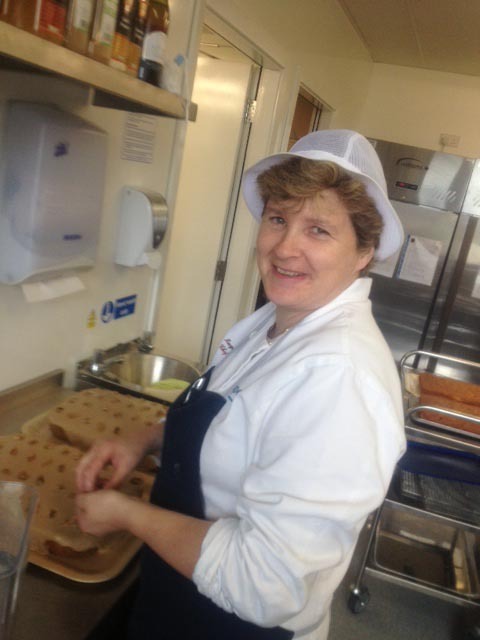 Margaret McFlynn, chef manager at Bupa’s Mugdock House Care Home in Bearsden, has spent the last 15 years perfecting her love for baking sweet treats for residents and staff. But after being inundated with requests from 13 other Bupa Scottish homes for the tips and tricks behind her popular bakery goods, Margaret has decided to share her top recipes with them. An electronic cook book has now been created and circulated to the 13 homes, which includes recipes for tempting desserts, tray bakes and cakes such as cream scones, ginger biscuits, brandy baskets, lemon meringue and vanilla cheesecake. Every morning Margaret bakes different treats from scratch for the residents and their families to enjoy throughout the home. While the residents love to enjoy all of Margaret’s baking, the big favourite is her shortbread. And residents also get the chance to try their hand at copying Margaret’s baking talents too as the event co-ordinators at Mugdock House Care Home regularly run cookery sessions using her best recipes. Margaret said: “I’ve worked for Bupa for more than 15 years now so when I started getting calls from other Bupa care homes that heard about my baking, I knew I had to get my recipes out of my head and down on paper. “I’ve always had a love of baking and seeing the smile on our residents’ faces when the treats are served up is just fantastic. “The residents at Mugdock House Care Home love the recipes I come up with but if anyone has a particular favourite, I’ll teach myself how to bake it. I also love the fact that residents interested in baking can continue to get pleasure from making delicious treats themselves. “It’s very flattering to have other Bupa chefs asking for my recipes. I guess word spread about how much I love to bake and how the residents were enjoying eating them so much. Resident Tibbie Hutchison said she is a big fan of Margaret’s work. She said: ‘I looked around a range of care homes before settling at Mugdock House Care Home and I’m so glad I did, I love living here. Lorraine Murray, Home Manager at Mugdock House Care Home, has already sent electronic copies of the recipe book to 13 homes across Scotland but is expecting to receive more requests in the near future. She said: “I think what Margaret is doing is just fantastic. Our residents here at Mugdock House Care Home absolutely love her baking and it’s a great excuse to get everyone together for a chat and cup of tea. It really shows our commitment to enabling residents to socialise with each other within the home.